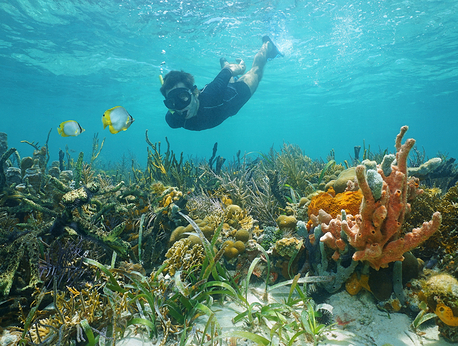 When you visit the Bahamas, you won't want to miss the beautiful coral reefs and undisturbed wildlife. On this tour, a guide will take you to just the right spot for snorkeling so you won't have to worry about figuring that out. Your equipment is also included! You will enjoy a scenic boat ride from the marina and once there, put on your equipment and you are set to relax and enjoy the warm waters. This tour provides you with plenty of time to enjoy snorkeling and the beach. After, once you work up an appetite, you will be able to indulge in delicious food complete with an open bar. This includes spirits, soft drinks, and beer so everyone will be happy! After, we will take you to the beach club where you will have access to different amenities. This includes various beach games, an ocean trampoline, beach chairs, and more. The beach club is a self-contained town that has everything you may want! There is a playground for kids and shops for adults. There is even entertainment for everyone! On this tour you can do whatever you want or nothing at all!